Customised courses are addressing growing demand from family-run businesses. Neha Gupta is enrolled in a 16-month course at the Indian School of Business (ISB), but she won't be looking for a job when it's over. The 23-year-old and her 44 classmates are all from business-owning families. "None of us are looking for a job at the end of the course, which is why the focus is not on marks," she says. "The interest and motivation is for what we can learn and re-create in our business." She is part of the founding class of ISB's tailor-made programme for family-run businesses in India. She is the daughter of Rajinder Gupta, Chairman of the Ludhiana-based $1-billion (Rs 6,272 crore) Trident Group, whose interests include terry towels, paper and chemicals. She has a master's degree in finance from the Cass Business School, London. She expects the ISB course will build her ability to make decisions, decentralise work, and professionalise her family-run business. ISB started the course, called the Management Programme for Family Business, on August 10 at its Mohali and Hyderabad campuses, to meet a growing need. "Indian and emerging markets mostly have family businesses... in the Asian context, the family business person is often the chairman," says Kavil Rama-chandran, Thomas Schmidheiny Chair Professor of Family Business and Wealth Management at ISB. He says over 70 per cent of India's top 500 companies by revenue are family-run. The proportion could be over 80 per cent in the top 1,000, he adds, as smaller businesses tend to be family-run. Even among big companies, the number is substantial: half of the top 50 companies are family-run. "There is a need to inculcate professional management capabilities in the family members of such a business," he says. Students in ISB's programme gain global exposure through study with international faculty, study at the Kellogg School of Management in the US, and visits to Africa, Europe and China. Classes are held for a week, every sixth week. ISB is not the first to offer a family business programme. The S.P. Jain Institute of Management & Research, Mumbai, has been running one since 1997, and the Narsee Monjee Institute of Management Studies (NMIMS), Mumbai, since 1999. S.P. 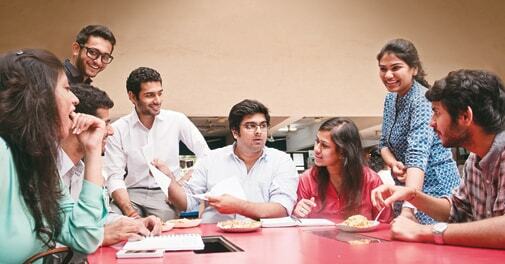 Jain's Rs 9-lakh, 18-month post-graduate programme started out with 16 students. Today it has 300. Among them is 23-year-old Devish Gala, whose family runs Navneet Education Ltd, a listed company formerly called Navneet Publications (India) Ltd. It was founded by his grandfather and brothers in 1959 to publish educational books. Today its business includes digital learning products and school management services. "In 12 months, when I hope to play a role in our family business, I would like to be involved in spotting and developing opportunities," says Gala. Parimal Merchant, Director of the S.P. Jain institute's Center for Family Managed Business, says the course is constantly evolving. "Today, for instance, family businesses do not just deal in family money - they have to learn to manage outside funds... We are therefore looking at newer models of financing, and VC and PE funds," he says. Merchant was recently in Karachi, Pakistan, where his institute and the local Institute of Business Administration jointly offer an "Owner Manager Programme", for people between 45 and 75 years old, who wish to be better equipped to do business in a changing climate. Since such courses are not regular MBAs, their structure and selection process are different. For instance, S.P. Jain's Owner Manager Programme holds classes for one-and-a-half days a month, for 12 months. "We launched it in Pakistan in October last year, and now we plan to take this to South Korea, Saudi Arabia, Indonesia and Vietnam," says Merchant. In its 18-month programme in Mumbai, classes are held for a week, every fourth week, so students can spend the rest of the month managing their business. The head of the family business, usually the student's father, is expected to visit campus at various points during the course. The selection process for such programmes is different from conventional MBAs. At ISB, instead of the GMAT, applicants take a Business Admissions Test. Admissions also depend on their knowledge of their family's business and their leadership potential there.